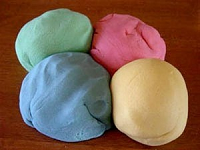 Welcome to the #1 resource for finding a fun and special playdough recipe for your own homemade playdough. We provide you with the popular Traditional Playdough Recipe, but also with other exciting playdough recipes such as Edible Playdough Recipe, Coffee Playdough Recipe and Alum Playdough Recipe. Being a parent I know how boring some days can be for children. Those rainy days can be really demanding. Activating your child with making and then playing with some homemade playdough gives you the opportunity for a cup of coffee. Cook on medium heat for 4-5 minutes, while constantly stiring. When desired texture is achieved, the playdough is finished, enjoy! In the menu to the right you can find a selection of other great and fun playdough recipes. Try out a few of them, I’m sure you’ll enjoy them!